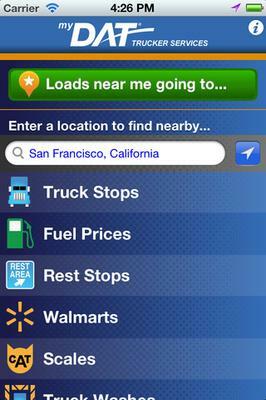 Check out the very helpful mobile app for truckers: ‘My DAT Trucker Services’ App for android, iPhone and blackberry. This Free app shows loads, nearby truck stops, fuel prices, truck scales, truck washes, rest areas, and Wal-marts currently, with more to come including trucker friendly hotels and truck service locations! there are some other great apps. i use bigroad for my logs and i email them to the boss .